Apple recently previewed the next major update for iOS 11 with a couple of major changes to the operating software. The updated OS comes also comes with a couple of minor improvements which aim to improve the overall user experience. One such change can be found in the authentication process for purchases made using Face ID on the iPhone X. 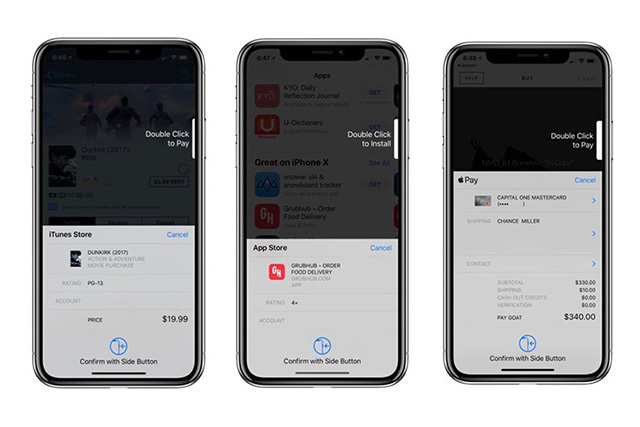 With the release of the iPhone X, which lacks Touch ID, Apple introduced a new way to authorize downloads and purchases made on the App Store, iTunes Store, and Apple Pay. In order to authorize purchases on the iPhone X, users have to double tap the power button and then authenticate with Face ID. The new method was introduced to prevent accidental purchases because of the way the Face ID authentication works. In previous iteration of iOS 11, the purchase prompt would read “Double Click to Install” in the upper-right corner next to the power button. Following the command opened the Face ID authentication prompt. While the implementation was seamless design wise, it was criticized by users as it wasn’t very intuitive. Now, with iOS 11.3, Apple has added a new prompt which appears right before the Face ID process begins. The purchase window now includes a “Confirm with Side Button” prompt at the bottom along with a graphical representation. While this might seem like a very minor change, it greatly simplifies the process for new users by providing clearer instructions. iPhone X users will receive the new Face ID authentication interface with the stable release of iOS 11.3, along with new Animoji, better power management, iCloud Messages, Business Chat, Health Records, and ARKit 1.5. The stable release is expected to come out sometime in ‘Spring’ this year, with no official release date defined by the company so far.